I'm about 5 minutes away from being figured out at work. I've been repeatedly spotted taking pictures of food, eating various foodstuffs, and knowing WAY too much about the dining options in the area. Friday's Crumbs opening didn't help; I came in early, toting a cupcake, which I took pictures of and tried to get on the interwebs. Obviously, I failed and Danny beat me to the Baba Booey punch. Oh, and the afternoon cupcake photo shoot wasn't a secret either. Yeah, I went twice and it was delicious. 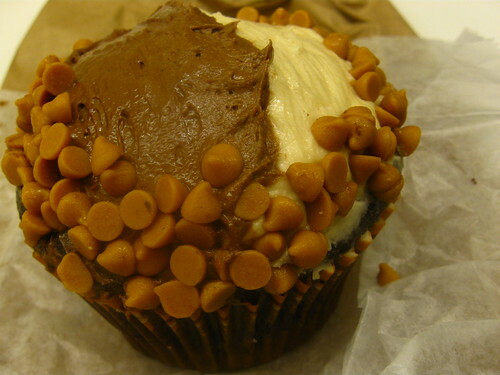 First, the Baba Booey: peanut butter cream cheese, chocolate cake and frosting, and peanut butter chips. Can this be wrong in any way? Don't answer that if you hate peanut butter. After eating one bite, I called Brownie to tell her about it as I ate the rest. The peanut butter scent permeated the paper bag hiding the cupcake in my drawer; whenever I opened it up, my immediate area smelled like peanut butter, making me very happy and hungry. 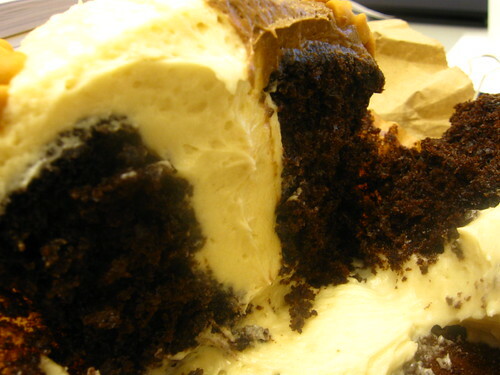 The filling is similar to a dense pudding and, as evidenced by the photos, fell out the bottom of my cupcake. The cake itself was their moist, rich chocolate cake. Between the filling and frosting, it's hard to not get peanut butter in chocolate in every bite which, in my book, makes this a winner. I devoured my allotted part and started picking at my colleague's. This is easily my new favorite cupcake from Crumbs. During lunch, I saw that they were still giving out cupcakes. I figured that since it was after the original 1,000, it was okay to go back and get seconds. Oh, and that same colleague wanted his own. By the time I got there, they were only handing out pre-bagged red velvets. 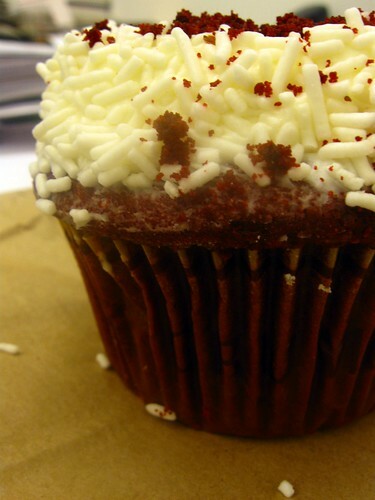 I like their red velvets, moist with subtle cocoa, not overwhelmed by food coloring, and a regular cream cheese frosting. Now I am officially Crumbs'd out. Though I like them, I think it may be a few weeks before I stop by again. This doesn't mean that you shouldn't! Thursday Morning Cartoons: Happy Thanksgiving!! What's for Breakfast? Free Crumbs Cupcakes!! The Red Cup is Back! BREAKING: Brooklyn Institution Now in Queens!! !